Outdoor living space is a great addition to any home. Building a small in-ground deck, where you excavate a hole just deep enough for the deck to sit flush with the surrounding yard, is a job that you can easily do yourself with a little skill, a few tools and some preparation. Compared with other outdoor living space options, in-ground decks are cheaper and less labor-intensive than interlocking stone patios, simpler than raised decks, and offer the warm texture of wood or composite decking. The natural texture of a deck is a big selling point for many. Mark the outline of your deck using wooden stakes and string, or spray paint. 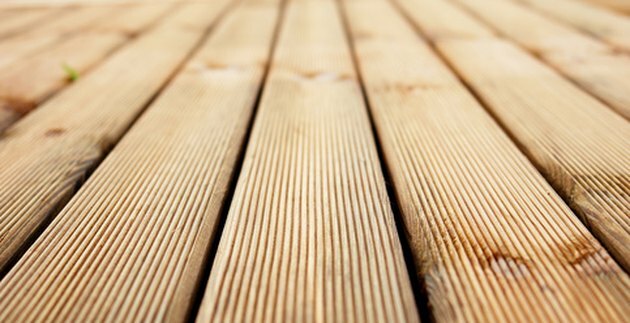 Choosing common board lengths such as 8 feet for your deck dimensions will minimize cuts and wasted wood. Excavate the area, digging just outside your marked lines. To calculate how deep to dig, add up the width of your framing lumber (usually 8 inches) plus thickness of the decking plus thickness of footing stones. For an in-ground deck, it is wise to use 4 large patio stones, one at each corner, as footings. For example, if your lumber is 2" x 8" boards, your decking is 2" thick, and your footings are 2" thick patio stones, you will need to dig a hole 12 inches deep. Level your paving stones. Using a string or board and a level, ensure that there is no slope between any of the corners. If you are planning to build the decking out of something impermeable, you will need to add 1/4 inch of slope per foot of deck length to ensure drainage. Attach joist hangers to two of your 2" x 8" boards. Space them evenly, with their centers 16 inches apart. Use deck screws and an electric drill, and do not over-tighten. Lay the two joist-hanging boards out parallel to each other, as far apart as the deck will be wide. Take your other 2" x 8" boards and attach them to the ends of your joist boards, using deck screws, to make a square. Cut the boards if necessary to reach the proper dimensions. Ensure that all the corners are right angles. Loosen and adjust the screws if needed before proceeding. Attach 2" x 6" joists to the joist hangers using deck screws. Lay your frame down into the excavated hole. Lay the decking boards down perpendicular to the joists. Attach them to each joist and to the edge boards using deck screws. Fill in the edges of your excavation around the finished deck. If the deck is sitting too low or too high, get friends to help you lift it out of the hole. You can then dig slightly deeper, or add material to raise the footings.